Bronx REACH CHAMPS, a coalition of partner organizations aiming to reduce obesity and improve the overall health and wellness of the community, is proud to announce another local store, Compare Foods on Cypress Avenue, has completed all seven steps of the Shop Healthy NYC program, and will receive a proclamation from the Bronx Borough President's Office. 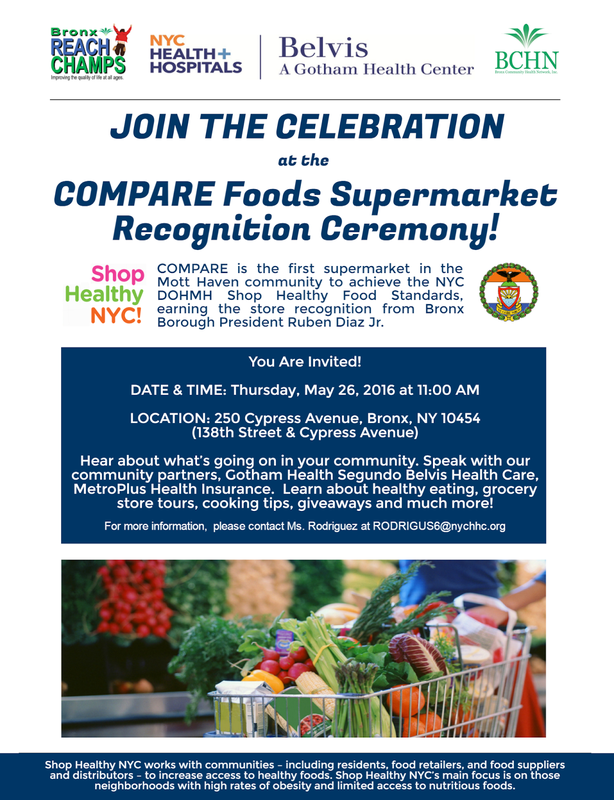 WHAT: The owner of Compare Foods (250 Cypress Ave) will be presented with a proclamation from the Bronx Borough President's Office. Chef Geneva Wilson will be sauteing fresh vegetables for Quinoa; offering a demonstration on how to make a breakfast parfait; discussing the benefits of healthy options like infused water or fruit and vegetables; and offering instruction on reading food labels. WHEN: Event begins Thursday, May 26 at 11:00am. Press check-in: 10:45am. The proclamation will be presented right outside the store, while the food demonstrations will take place inside. WHY: Supporting Compare Foods and other supermarkets, delis and bodegas that bring healthy options to the Bronx is important. Spreading the word (media, local residents) is invaluable in letting Bronxites know where they can purchase healthy food.